Whether you need help recovering from an accident, surgery, or need long term care for a chronic illness or disability, home health care is often a viable option that has been gaining popularity, for a reason. Studies have shown that recovering at home is better for a patient’s physical and mental health. Today’s home health care services can provide everything from help with errands and chores like cooking and cleaning, to skilled medical care from nurses and therapists. But with so many new home health care agencies popping up, how do you know which one to choose? o Check out the agency’s credentials. 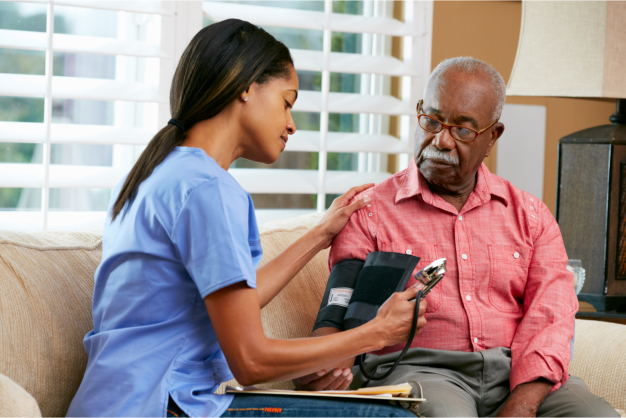 Make sure the home health care service you choose is licensed in your state, is certified by Medicare, and is accredited by a governing agency such as The Joint Commission’s Home Care Accreditation Program. o Check out the caregivers’ credentials. Besides looking for providers that are friendly and helpful, make sure you inquire about the caregivers’ professional training. Are they bonded and insured? Does the home health care service have a supervisor oversee the quality of the service? Also, ask for references for the caregivers themselves, and find out if the home health care agency screens their employees. o Clarify all billing issues. The agency should be able to provide literature clearly explaining its fees and services. Make sure you know up front about co-pays, deductibles, and uncovered expenses. Ask if they offer any kind of financial assistance to those in need. o Be clear on what services you are getting. Inquire about receiving a written plan detailing the services you will be receiving, so that there is no confusion. Make sure you know the specific services your home health caregiver will be providing, including any chores or housework. Also, find out what hours the home health care service provider has on-call help, in case of an emergency. A 24 hour hotline with someone on call is desirable and helpful. Finally, after your home health care plan is in place, monitor the services, making sure it is in line with what was actually discussed. By taking these steps you can assure that your home health care service will be beneficial to all.